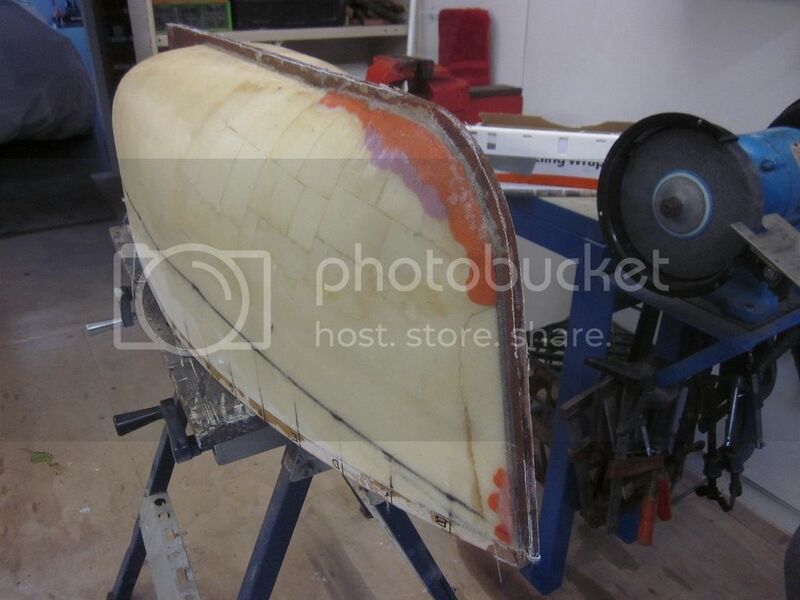 Sorry for any confusion Robert (and Bob, I wasn't considering taking camber into account at this stage) but I was looking at it from the point that you were going to shape the hull from the keel down to the board. 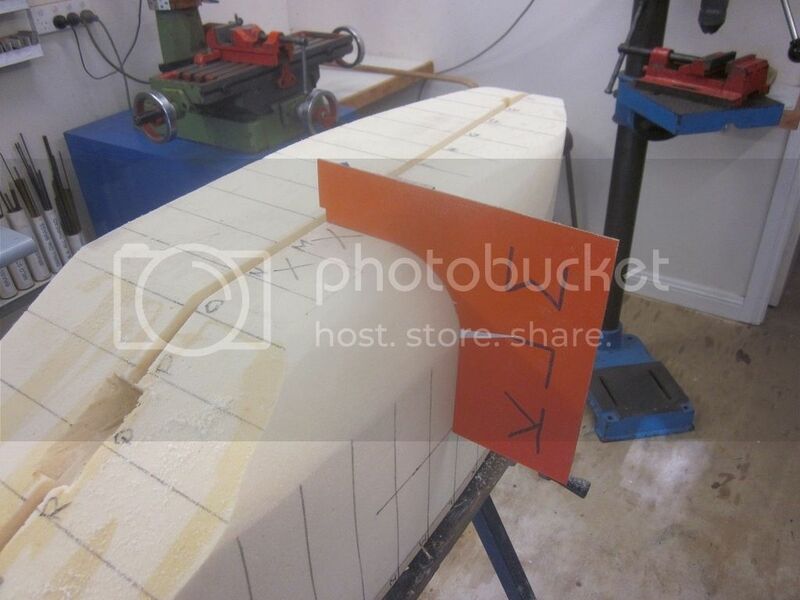 Obviously if the block is shaped perpendicular to the board to begin with then the sheer line is drawn on and the hull shaped to that from the keel down you will arrive at your desired deck plan. I think that the midship sections are much better and will allow you much better positioning of the plant - particularly lower down keeping the CG as low as possible. Having settled on a profile thanks to the input from my fellow forum members I have commenced the flank shaping. I have to take this really slowly with lots of care as I prefer not to have to add foam if I go too deep. I am using the same profile for K L & M as they are very similar to within a mm or 2. I find I can shape the foam with the surform tool to within about 10mm and then use a coarse sandpaper on a rubber block to bring it to the shape. it is quite a bit slower but less stressful. Progress is going well, The port side is done and I am pleased with the shape and finish, and the cardboard cut outs worked well for me. 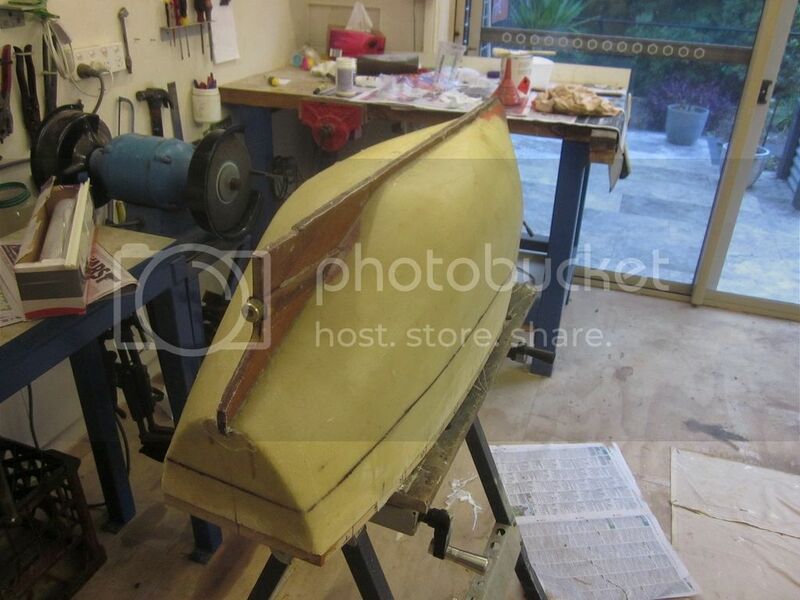 The side starboard will be a bit less stressful, as as well as the cut outs I have the other side to guide me. Quick progress on the carving, nice!! It has been a little while since I posted a progress report, mainly due to holidays away and other comments. But another reason was my disappointment with the profile of the mould on the port side after shaping it. It looked fine on the CADD drawings but not quite right in reality. In forming the starboard side I address this and was happy very with the shape. So the tricky part was to fix up the first side as it required building up. I cut thin patches of foam about 10mm thick and attached them with hot melt glue, re smoothed to match the good side which seemed to work well apart from the very front where I built up the shape with play doh. It looks absolutely horrible but when all the glass goes on and the foam and doh removed I am sure all will be OK. I cannot get this part done quickly enough so no one else sees the patch up job I have had to do (including myself) Shaping metal is by far easier and rewarding, foam is not. I don't pretend to understand all the ship jargon Robert, but it sure looks nice from what I see. The whole process is fascinating!! Still fibre glassing, this side is the last sheet to go on, then the other side in a couple of days and the glassing will be finished. After that some more sanding then a coating of filler or probably several coats to get the surfaces very smooth and straight. 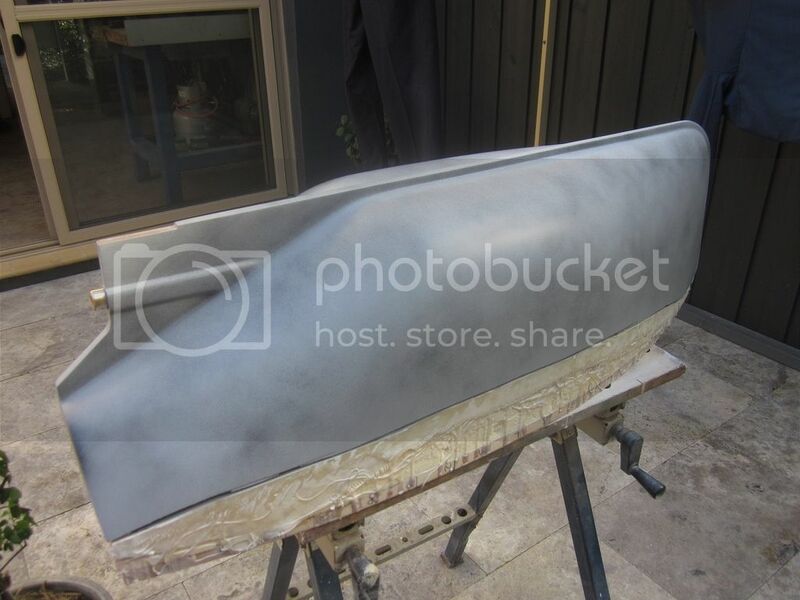 I plan to spray a coating of primer between filler coats so that after sanding the low spots will show up. On completion of the fibre glassing and filling with ‘bog’ I next thought about spraying it with a ‘high build’ primer so following that I could get the sides really flat and smooth. The local car accessories shop sells pressure pack high build primer but of course it is only ‘single pack’ not two pack. I do have a spray gun but it is only suitable for regular paints, not thick ones. So I gave an old acquaintance a call to ask his advice on weather single pack would be suitable or not (he is a professional spray painter/panel beater). He strongly recommended two pack and offered to spray it for me the next day as he was going to spray a car (1971 Holden Monaro) with high build. So I high tailed around there (only half an hour away) left it with him and pick it up the day after. He has done a lovely job and I am very pleased indeed. I forgot to ask him why they apply a very light and spasmodic splash of black over the primer. I have seen this on primed cars previously, any one any ideas on this? 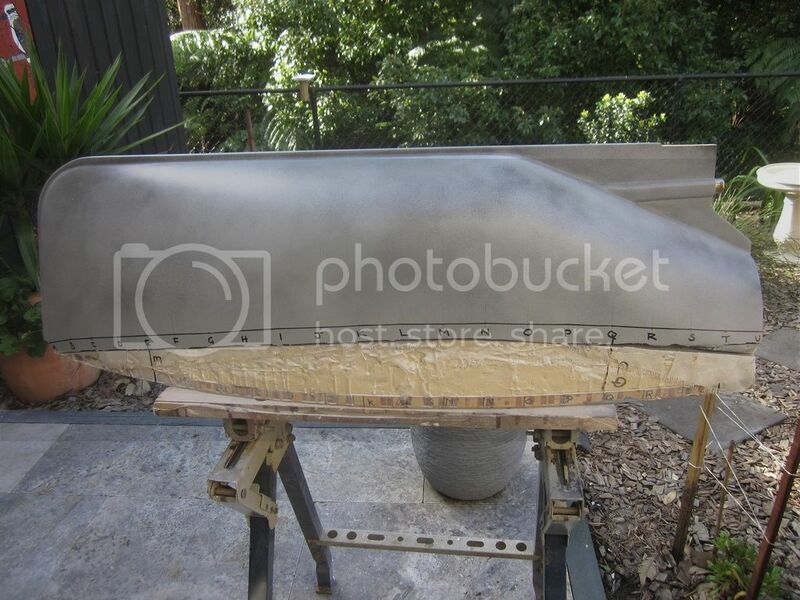 The next job is to make a stand for the hull so I can get it the correct way up and start work on removing/cleaning away the foam and cutting the side to the correct deck line. The black line is the cut line for the deck position. I have seen the light paint coat sprayed on top used as a guide when block sanding - lets you see where the low spots are since they dont change color. Thanks Crueby, I was thinking along those lines after giving it more thought. Also sorry about the duplicate picture - senior moment. Lovely work Robert and I do like the shape. 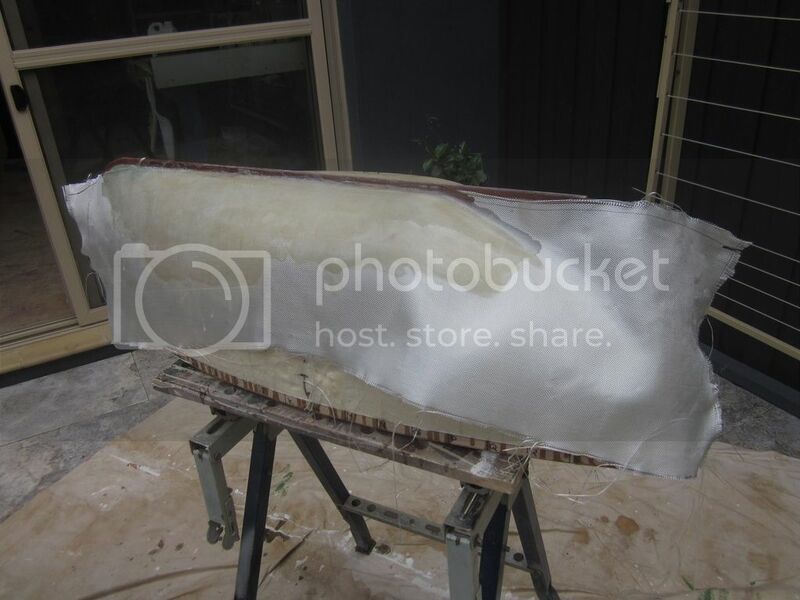 I however have a question about after you remove the foam, are you placing ribs inside for any support and could you have done so before fiberglass? 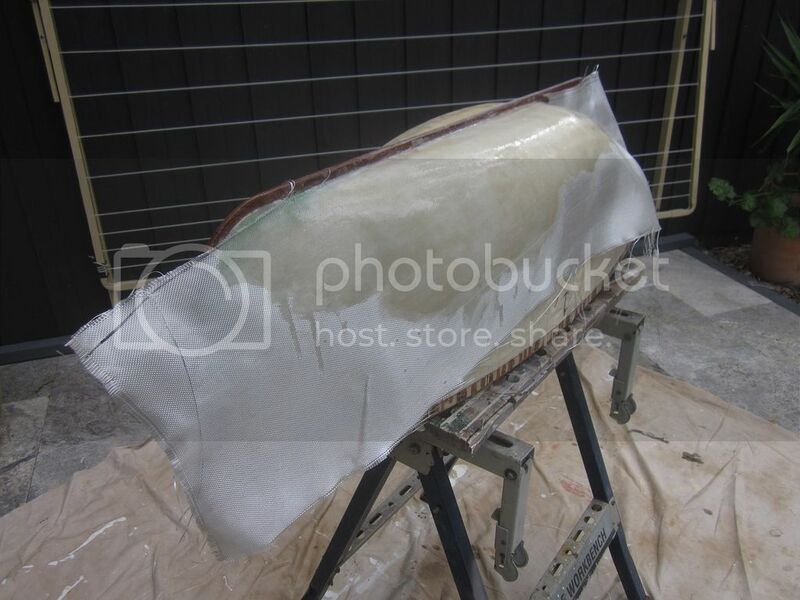 I don't know anything about fiberglass work so just asking if the fiberglass is strong enough without them. It sure looks good to me Robert. Still looking forward to further progress.